Applications are invited from suitably qualified candidates for admission into the Ekiti State University Teaching Hospital (EKSUTH) school of nursing for the 2018/2019 academic session. 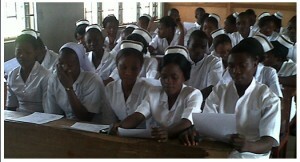 EKSU Teaching Hospital School Of Nursing Admission Entry Requirements. Candidate must possess a minimum of Five Credits in WASC/SSCE/NECO to include English Language, Mathematics, Biology, Chemistry and Physics at not more than two sittings and candidate must attain the age of 17 years in 2018. How to Apply for EKSUTH School Of Nursing Admission. Account Name:School of Nursing, Ado Ekiti. CLOSING DATE: Friday, 24TH AUGUST, 2018. DATE OF EXAMINATION: Saturday 25th August, 2018 by 11:00 a.m. EXAMINATION VENUE: At centers as designated on notification slips. FOR FURTHER ENQUIRIES: Please contact the office of the Pricipal, School of Nursing, EXSUTH, ADO-EKITI.